Borg El Arab International Airport (IATA: HBE, ICAO: HEBA) (Arabic:مطار برج العرب الدولي) is an airport serving Alexandria, Egypt. It is located about 40 km (25 mi) southwest of Alexandria, in Borg El Arab (alternate spellings: Borg Al Arab, Burg Al Arab or Burg El Arab). 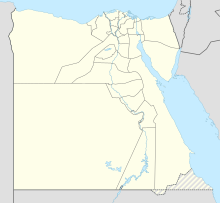 The airport also serves the nearby areas of the Nile Delta. Borg El Arab is the principal airport of Alexandria since December 2011 after the closure of Alexandria International Airport due to a major re-development program. Borg El Arab Airport had a major expansion in terms of the airport's passenger and cargo handling capacity in response to growing demand and the new facilities were inaugurated in 2010. Ground floor: allocated for checking in and luggage handling. Second floor: allocated for arrivals, both domestic and international, in addition to administrative offices and airlines offices. Third floor: allocated for departures, both domestic and international, immigration procedures and a VIP hall. Commercial activities are spread among the three floors. Four movable boarding bridges connect the terminal building to aircraft. The terminal contains a duty-free shop, a franchise food court, an area dedicated for travel offices and other travel-related services, a fuel supply unit, a control tower, and a fire station available to cover emergencies on site. A parking area on the in front of the building provides space for 350 vehicles. The airport has the capacity to handle 1.2 million passengers per year becoming an adequate replacement to Alexandria International Airport, which shut down in summer 2010 while the airport's facilities are overhauled. During this time all airlines operating to Alexandria will transfer to Borg El Arab Airport. In June 2009, governmental plans to develop an extension of Alexandria with an area of 390 acres (1.6 km2) located to the west of the old city were revealed. It would be later known as "New Alexandria". The new city is planned to be linked to Borg Al-Arab airport via the ring road with an estimated travel time of 25 minutes. The President also inaugurated Borg Al-Arab International Airport, the recent in a series of new airports and development of old ones with the purpose of serving development. After economic woes plagued the country following the 2011 Egyptian Revolution, the renovation of El Nouzha Airport was put on hold, leaving Borg El Arab as the only airport serving Alexandria. ^ Airport information for HEBA at World Aero Data. Data current as of October 2006.Source: DAFIF. ^ Airport information for HBE at Great Circle Mapper. Source: DAFIF (effective October 2006). ^ a b "Destinations - Air Arabia". www.airarabia.com. ^ "Gulf Air expands S18 network". Routesonline. 26 February 2018. Retrieved 26 February 2018. ^ "Jazeera Airways - Destinations". www.jazeeraairways.com. ^ "Oman Air files expanded new routes in S19". Routesonline. 14 January 2019. ^ "SalamAir adds Borg el Arab service from March 2019". Routesonline. 8 February 2019. This page was last edited on 5 April 2019, at 06:04 (UTC).